Destination Knowlton >: Finally! I Can Hear You Now! Ever since I moved to Knowlton four years ago I have been tormented by the lack of quality cell phone service in areas of Lac Brome. Now it looks like there is hope on the horizon...well there is something on the horizon and it's hard to miss actually...the new cell phone tower is being erected in Knowlton this week and the anticipation is growing for having a full set of 5 bars on the new Motorolo phones that our kids all love these days! I can barely keep track of how many times my wife has gone to the WalMart in Cowansville to buy kitty litter for our elderly cat and after she had driven down past Frizzle Road into the valley and I step out onto the flat grassy plains of Lac Brome and open my Samsung to call her on my cell phone to tell her to buy a few extras...and I flip my clam shell to see...BAM!...NO SERVICE! There are no bars! No Service! Drat Darn Collisss! How can I contact my wife to ask her to pick me up some Pringles and Charmin Soft Wipes which I've just noticed are on sale in the publi-sac flyer!! "Curse you O expensive cellphone", I've cried many times, "I have no reception in this gosh fersakin' town known as Knowlton!" But now...it looks like those days are coming to an end because we're seeing evidence that the new cellphone tower is finally going up on the Brome Lake Duck Farm property on the banks of the Coldbrook. Finally the Telus and Rogers and Bell Generation who have been giving so much to the people of Canada will finally be rewarded by gaining another foothold via a town bowing to the prospective profits and all of us with cell phones who need to download ringtones and stare at NHL scores via realtime will finally have a huge metal erection above the fields of Brome to point towards for crystal clear and perfect reception for these sublime pleasures! Bravo! According to some in the industry of the fifteen cents per kb religion it is almost unbearable to even live without proper cellphone coverage and the fact that Knowlton will soon be a full 5 bar stronghold should come as good news to all of us who somehow felt isolated and lost in the peacefullness that was once Lac Brome. At least the leaders of our town have seen fit to do the right thing in keeping us on par with the rest of the modern world! how people got along before cellphones and the ability to watch YouTube selections on their BlackBerry's and of course, all kidding aside,today's business runs on instant communication! At least we can be assured of one thing! There will be no lights on the tower to spoil the nightime peace of Lac Brome. We won't see the tower at night because we were assured last summer, when the approval of the cell tower was waltzing through the summer council meeting when only a handfull of residents were on hand, that there would be no lights on the tower. 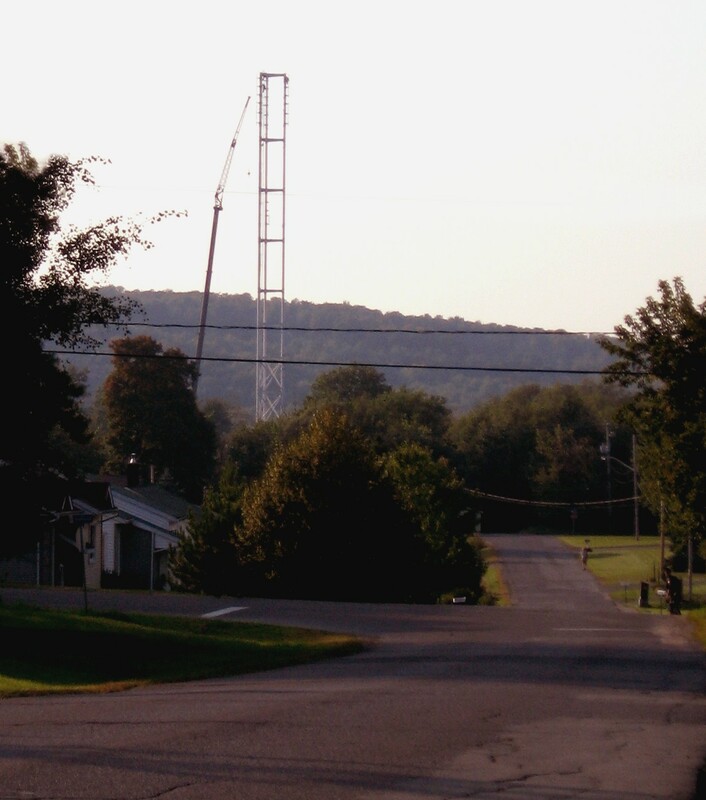 In 2006, when there was talk of adding the cell tower to Brome, a long time taxpayer and resident asked the question about the visual implications (including nighttime implications) of the tower and the Mayor stated tersely and categorically that there would be no lights on the structure and that the esthetic impact would be minimal! So while the icy steel tower may grate a few nerves during the day at least at night residents along Victoria, Pine, Oak and in the Coldbrook Condos won't have to see the darned thing spoil the Milky Way because there won't be any lights on it, said the Mayor in 2006. Some folks might wonder in amazement how a structure that practically seems to reach the stratospher would not require lighting for safety or even the attention of air traffic controllers due to the sheer prominance of the structure or how, for that matter, could something so big erected in a prominant area not impact the esthetic beauty of Lac Brome. At least we will be able to pick up our cell phones and order a last-minute six pack of Timbits from our wives when she goes to Cowansville for Cat food! For that luxury...a huge tower like the new cell phone tower in Knowlton will have paid for itself many times over! Bring it on! I Can hear You Know! !